It was a spectacular edition of the Veikkausliiga this year, as SJK won their first title in club history and HJK, who had won 6 titles in a row, ended up in third place. RoPS, with the Canadian goalkeeper Tomer Chencinski, ended up in second place by only one point after SJK and one point ahead of HJK. The last week of the season was really exciting, both SJK & RoPS got an early lead but FF Jaro with Jamar Dixon on top, played really well and had a couple of really good chances to score an equalizing goal. Unfortunately for Chencinski & RoPS, SJK got their win at home and the historical title was realized. The title is even more impressive considering that SJK played in the 3rd highest division just 5 years ago. One of the questions to ask after this season is what will happen with HJK? Is their “golden era” over now? It’s probably too soon to say. After all, they made it to the group stage of Europa League last year which generated a lot of cash, so perhaps this was just a one-off season for them. As the situation is in Sweden with Malmö FF, we probably need to wait and see which effects this season really had. Tomer Chencinski signed for the Rovaniemi club RoPS in January 2015 after two years in the Israeli soccer. It’s not the first time that Chencinski has played soccer in a nordic country, as he played one year for the Finnish club VPS from Vaasa back in 2011 and one year for the Swedish club Örebro in 2012. His current club RoPS is from the northern part of Finland not that far from the Swedish border. RoPS is not a club who are used to being a top team in the Finnish 1st division, so the second place that they ended up on was a great result for them. Tomer was unfortunately injured for a couple of weeks during the season, but his stats for RoPS is nevertheless impressive. He played 12 league games and had five shutouts, which of course is very impressive. Tomer was also on loan for a short period of time, probably to get match fit after the injury, and he played two games for the club with the phenomenally named FC Santa Claus (we all want a FC Santa Claus jersey don’t we?). Chencinski might not have played as much for RoPS as he probably wanted, but he definitely had an important role in RoPS this successful season. Chencinski has shown not just this season, but also earlier, that he definitely can play on a high level. Perhaps HJK or a club in the Swedish or Norwegian top division could be interested to sign him. I’m not saying it’s a trend… but it seems like Canadian keepers perform well in Finnish soccer. David Monsalve for example, had an excellent season last year in AC Oulu. So Chencinski & Monsalve have definitely done a good job to build up a good reputation for Canadian goalkeepers in Finland. KuPS continued to be a mid-table team from recent years, even though they dropped from a 7th place last year to a 9th place this season. One of the main reason was probably the lack of a proper goal scorer. The 2014 season was a great season for Charlie Trafford, and he played 28 of 33 games (five of those for TPS), scoring 3 goals and ended up with 2 awards (player of the year & goal of the year). So what are the details of his season? Trafford participated in 28 of 33 league games, of which 23 were from start. He was also the top scorer for KuPS this season with five goals. So he definitely kept his position as a key player for KuPS at least until October when KuPS' coach for some reason didn’t play him that much. Another success for Trafford this season was of course the first call up to the national team to their game against Ghana, in which he also played from start. So what’s next for Trafford? He will most likely leave KuPS, and his passing skills, game intelligence and composure is according to me, definitely good enough for a higher level. Like Simon Thomas in Norway, shortly after writing this review, Trafford has taken a step up in his career, signing for Polish side Korona Kielce. The career Jamar Dixon so far isn’t just very interesting, but actually very inspiring and not just for other soccer players but for anyone. 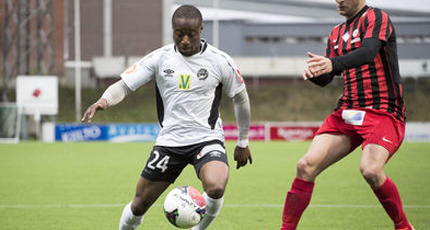 After he left Victoria Highlanders 2011, Dixon played soccer in the Swedish div. 3 (5th div), Swe div. 2 (4th div), Finnish Kakkonen (div. 3), Fin. Ykkönen (div. 2). 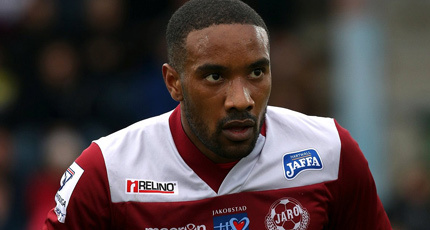 After three years within the Swedish & Finnish soccer system, Jamar Dixon earned a 1+1 year contract for the Finnish top division club FF Jaro. Jamar Dixon’s climbing from the Swedish 5th division to the Finnish top division shows that you can reach success with hard work and some patience. FF Jaro is a club from Jakobstad, which is located on the Finnish west coast. Jakobstad have a partly Swedish speaking population, so maybe Dixon's time in Sweden was useful for him in his new environment. Unfortunately, Jaro had a really tough season this year and ended up on last place which meant relegation. Jaro have been a bottom team for years (except last year when they ended up on 6th place), so perhaps it wasn’t that shocking. The league didn’t start in a great way for Dixon, as he accidently injured the Finnish international Petteri Forsell. And there was some discussions after the game regarding the situation where some pretty unpleasant things was said about Dixon. Jamar Dixon didn’t let that situation ruin his season, and he played 27 of 33 games for FF Jaro (19 from start) and scored 3 goals. But it’s actually not the amount of games that Dixon has played that impresses me most, it’s the amount of positions that he has played. He has played as a defender, midfielder, striker… or to sum it up, he hasn’t played yet as a goalkeeper. And he has performed well no matter which position he has played in, at least according to the updates that I have received over the season. And that’s why I think Jamar Dixon is such an interesting player. It doesn’t seem to make any difference which position Dixon has or which level he plays on, he always seems to be an appreciated player. I don’t know at this point if FF Jaro will use the clause and sign Dixon for another year, but I hope that they won’t and that he will continue to play professional soccer in a first division, he definitely deserves it. No less than 3 former Whitecaps player played in OBOS-ligaen this season, unfortunately none of them played for a top team. It was Sogndal who won OBOS-ligaen this season, 9 points ahead of Brann. Sogndal and Brann were two of the relegated teams from Tippeligaen last year, and both managed to directly return to the Norwegian top division. Andrew Gray's career has several similarities with Jamar Dixon’s, which shouldn't be a surprise since they both traveled together to begin their soccer journey in Europe. 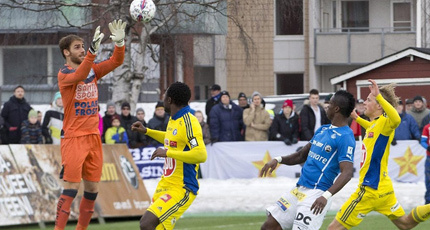 Just like Dixon, Gray has been climbing the soccer ladder in Finland. 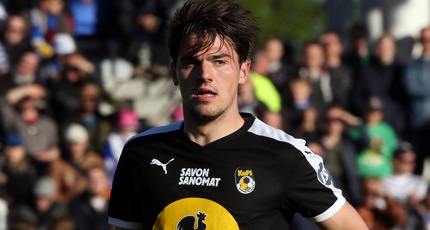 Gray participated in 9 games and scored 2 goals during the 2014 season when he played for the Finnish 3rd div. (Kakkonen) team OPS. Gray must have made a good impression in OPS because he was able to sign for the 2nd. div team FC Haka in April 2015. He played 22 games for FC Haka this season, five of those from start, unfortunately he didn’t score any goals this season. Gray was also on a trial for FF Jaro in February, but Jaro decided not to sign him. It’s a bit unfortunate that Dixon & Gray, who was teammates in 2012 when they both played for the Swedish club Juventus IF in div. 3 (5th div), didn’t have the chance to take the step into the top division soccer together. Pallokerho Keski-Uusimaa played in the Finnish 3rd division for the 3rd year in a row. They have played in the Eastern division earlier years and used to be a mid-table team. Unluckily for PPKU they had to change division to the southern division 3 which seems to have been much tougher for them. PPKU ended up on 8th place which meant a relegation. German-Canadian defender Christopher Suta was on trial for the 2nd division FC Jazz for 2 weeks during the preseason but he didn’t a contract there. But fortunately for Suta, the 3rd division club PPKU had scouted him for a while and decided to sign him. Suta played 26 games (24 in the league & 2 in the cup) for PKKU and scored 1 goal during the 2015 season.